Our agency "Socotra Tamam" started working as an agent for sailors coming to Socotra island. 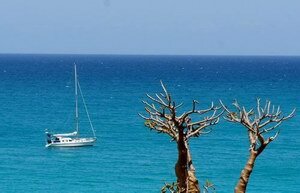 We arrange all the necessary documents on Socotra, help you to fill the boat with water and fuel, buy food, do your laundry. Better to come in a day time. You have to wait aboard till sequirity come to the boat for custome and immigration control. We advise you to read the report of the yacht Delta, where you will find detailed information about сruising on Socotra island.